How to stream with Telestream WireCast. Select an encoder from the "Encoder Preset" menu. 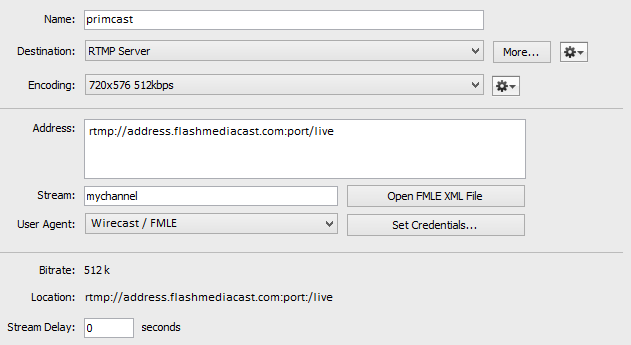 Wirecast can stream to several Flash Streaming Servers, including Flash Media Server (Adobe) and Wowza Streaming Server (Wowza). In the menu bar, go to "Output" and click on the "Output Settings". In the "Select an Output Destination" dialog box, select "RTMP Server" and then click "OK". Now you will need to set your credentials. Click on the "Set Credentials..." button, write your provided username and password and then click "OK". After you have logged in, click the "Stream" button at the top of the Main window.